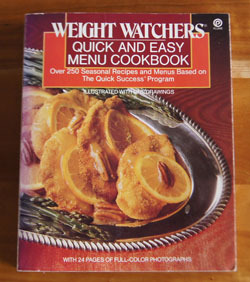 Cookbook #223: Weight Watchers Quick and Easy Menu Cookbook, Weight Watchers International, Nal Penguin, Inc., NY, 198. This is the second Weight Watchers book that I have covered in this blog, the other was Weight Watchers 365-Day Menu Cookbook. In general, I like Weight Watchers. My best word is “sensible” for the eating plans. 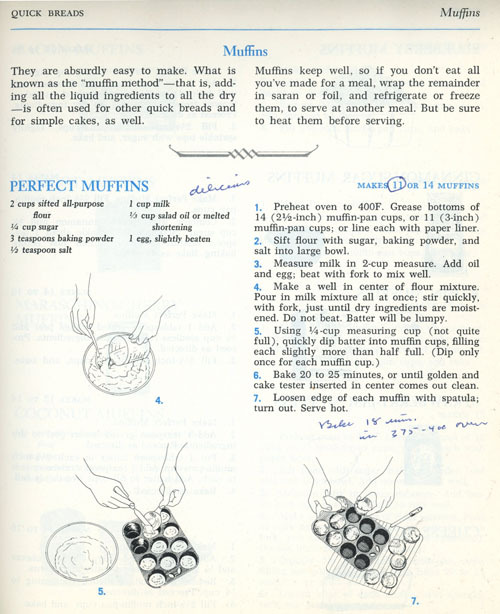 Weight Watchers’ plans of the 1980s espoused foods from the entire food pyramid, and taught dieters to watch their portions, learn the foods that have the most calories, and learn the foods that have the most nutrients. They help dieters learn how to eat and enjoy a balanced diet – a “normal” diet, not a “fad” diet – and this knowledge should help them beyond the initial strict dieting phase. I found Weight Watchers 365-Day Menu Cookbook a bit “weird” – read my post to find out why. This Weight Watchers cookbook looks more promising. I immediately find a couple recipes I could cook for this blog. It is nicely laid out, with each page being a meal plan for one day (breakfast, lunch dinner, snacks) tucked in a column to the left, and a full recipe for one of those meal plan items on the right. As I scan the recipes, I realize that ingredients are pretty much what I already have in my pantry, so no special trips to the market to find an odd ingredient are needed. Below is a recipe I tried. It illustrated how the book is laid out. I like the large variety of fresh vegetables in the recipes. The chapters are organized by month of the year, so that you are able to use the fresh foods most abundant at the moment in the market. There are several full page color photos scattered throughout the book. 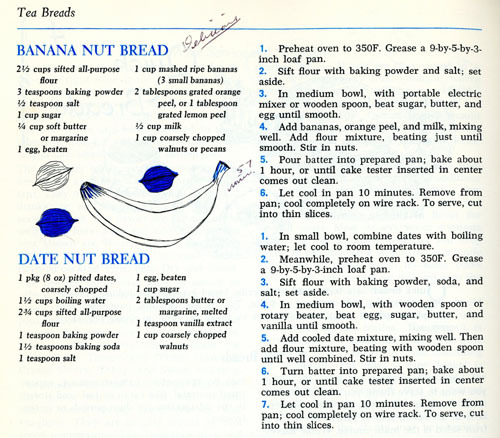 And I like the way each recipe lists calories and exchanges (bread, milk, vegetable, protein, fat), kind of like the diabetic diet book I covered, The Calculating Cook. One of the recipes I like is the “Swiss Chard Gnocchi”. 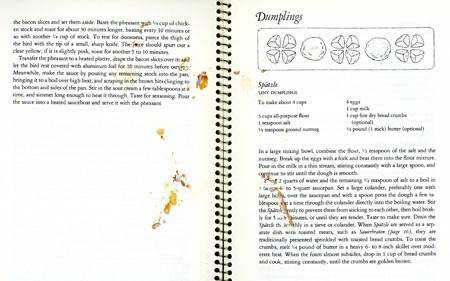 It is reminescent of the dumplings of my recent blog post, the Cooking of Germany, but the Weight Watchers version incorporates a fresh vegetable (swiss chard) for a less-calorie higher-nutrient version of a dumpling. “Greek Vegetarian Pitas” include cucumber, bell pepper, fresh parsley, garbanzo beans, tahini, yogurt, mint, and feta cheese. Several recipes include kale and fennel. 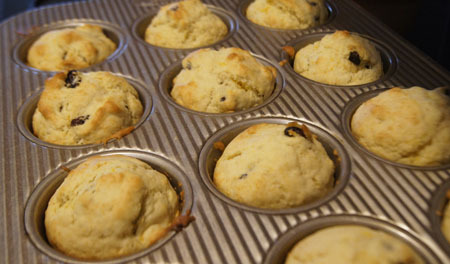 Muffins have raisins and freshly grated carrot. “Capered Turkey Amandine” calls for almonds, capers, and parsley. I’d like to try the “Apple Crisp with Graham Crackers”, since I am always looking for low calorie desserts, and I have lots of graham crackers at the moment, and have never thought of putting graham crackers on an apple crisp. 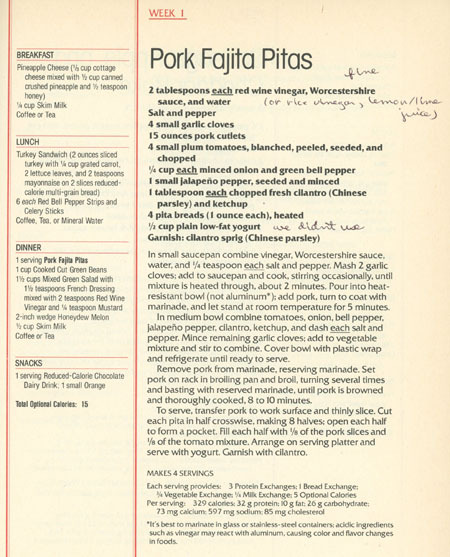 I like this too: almost all the main dish recipes are written for two people. So convenient for this retired couple. I marked one recipe as tried, the “Pork Fajita Pitas”. I like this cook book well enough to keep it. 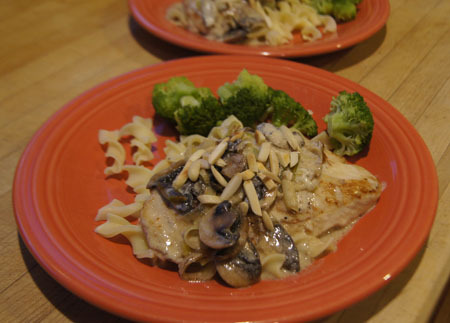 For this blog, I’ll make the “Chicken ‘n’ Noodles Amandine”. Thus, I would weigh out 2 ounces of dry noodles for about 200 calories. I know how much pasta we like: in general, I weigh out 3-4 ounces of dry pastas like spaghetti and penne for the two of us. I used one big boneless chicken breast, about 12 ounces, and cut it in two horizontally, and pounded it a tiny bit to flatten it. Two people can be a guy and a girl, so sometimes portion sizes have to be nudged. Below is my version of the recipe. It may have more calories than the printed version. Toast the almonds in a dry, non-stick pan until golden. Set aside. Saute the chicken breasts in a skillet in a bit of hot olive oil. 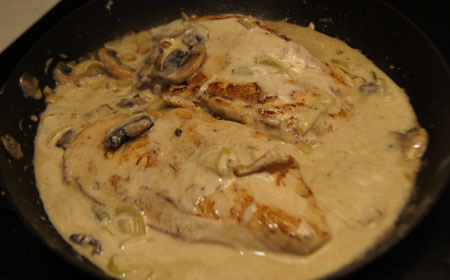 When both sides of the chicken are browned (about 3 minutes per side), remove them from the skillet and set aside. In the same skillet, melt the tablespoon of butter. Saute the mushrooms and green onions until tender-crisp, then sprinkle the flour over them and stir. Gradually stir in the water (or stock). Stir in the sour cream and salt and pepper to taste. Turn the heat to low, and add back the chicken. Simmer about 5-10 minutes, until all is hot. 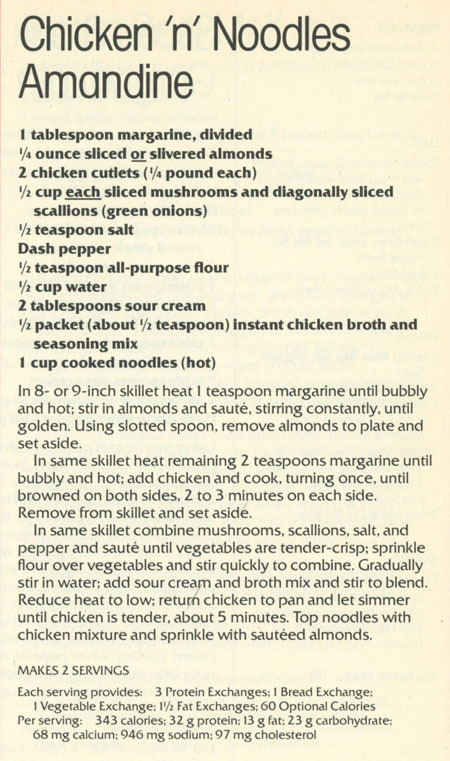 Serve over noodles and sprinkle with the toasted almonds. These were tasty and very easy to make. The sauce was a bit thin for our tastes; next time I would add more than a tablespoon of flour. But all-in-all, a success! Cookbook #222: Cooking of Germany, Nika Standen Hazelton and the Editors of Time-Life Books, Time-Life Books, NY, 1969. Foods of the World series; revised 1973, reprinted 1974. This is the fifth and last book that I own in the Foods of the World series. Once again, I look forward to discovering another interesting author as I open Cooking of Germany, just as I discovered M. F. K. Fisher in the Cooking of Provinvial France, Emily Hahn in the Cooking of China, Joseph Wechsberg in Cooking of Vienna’s Empire, and Rafael Steinberg in the Cooking of Japan. Nika Standen Hazelton is the author, and who is she? Let’s see what I can find. She was born in 1908, in Rome; her father was a German diplomat. She studied at the London School of Economics and began a career as a European journalist at the young age of 22, in 1930. In 1940, she emigrated to the US with her husband. In the States, she started writing cookbooks. Her obituary states she authored 30 cookbooks, and also “was a frequent contributer to the major food magazines and for several decades wrote a column about food, wine and travel for The National Review“. 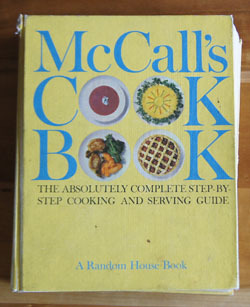 Her writing style wove memoirs into her recipes, and several of her books remain cookbook standards. Her attitude towards cooking is described as “no-nonsense”. 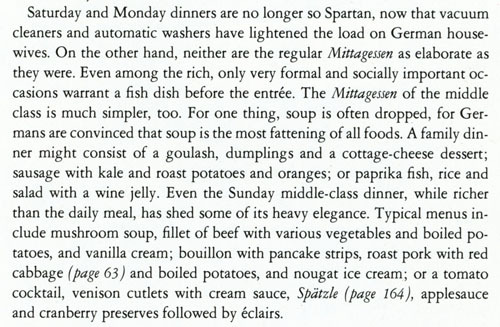 “Searching for Nika Hazelton, the no-nonsense cook” is a delightful 2011 blog entry by Sandra Lee. I chuckled several times at Sandra’s descriptions of this apparently full-of-attitude author. “Food and cooking are pleasant and comforting in themselves.” A woman after my own heart. 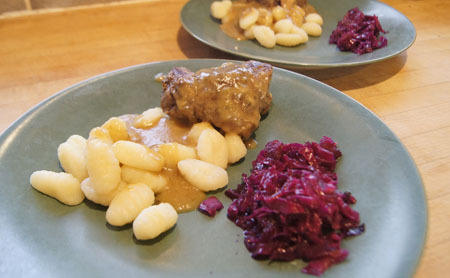 The five-meals-a-day chapter exemplifies Nika Hazelton’s character as she describes not only the food, but the people and the traditions of German cooking. She takes us through a day in the life of a German in the mid-twentieth century, weaving the hours with people coming together and enjoying food, and compares the experiences of Germans today with those of yesteryears. At the end of the second (and each) chapter are recipes. Katerfisch, or “Fish for a Hangover” with tomato sauce and pickles, and Röllmopse, or “Rollmops”, are herring rolls filled with onion and pickle, “prized as a pick-me-up on a morning after”. Ah, those Germans. 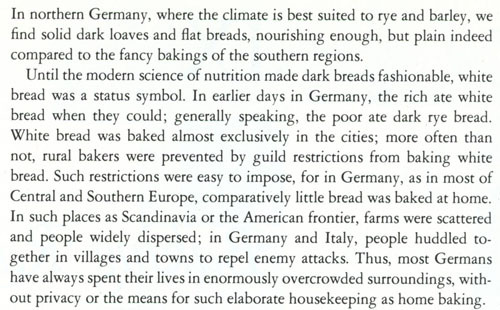 The flavor and of the Cooking of Germany continues to the end of the book. The next chapters are “A Cooking History 2,000 Years Old”, “The Northern Style: Cold-Climate Cuisine”, “The Central Style: Rich and Filling”, “The Southern Style: A lighter Touch”, “Baking Raised to a Fine Art”, and “Festive Revelry and Nostalgic Holidays”. Here are a few thoughts about these chapters. There is a great photo of a potato on page 134. I learn that potatoes are a new world vegetable, and of all the Europeans, Germans were the last import them. Today, potatoes are called “The King” of German vegetables and are used for Schnaps (an alcoholic beverage), dessert dumplings, hot potato salad, potato pancakes, potato soup, and potato dumplings, among other dishes. One of my favorite pages is the photo on page 154 of 26 different kinds of German wursts (sausages). “Everybody rejoices when November kills its pig” is the title of a photo caption. I enjoy the “Baking Raised to a Fine Art” chapter. Wonderful photos of German yeast breads. 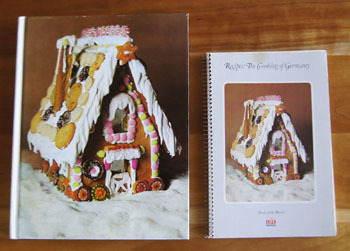 Photos of desserts, fancy and rich, like the gingerbread house on the cover of the book. As you can see, the consultant was Irma Rhode. Born in 1900, she earned PhD in chemistry. I can imagine that she was the only female in her classes. Heck, I was one of the few women taking chemistry in the 1960s! Time to get cooking! I pick up the spiral-bound book of recipes that accompanies the hardcover. 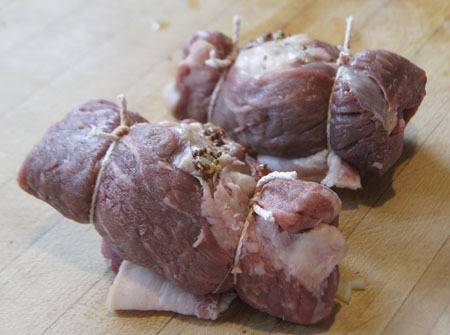 I decide to make Rouladen for this blog. 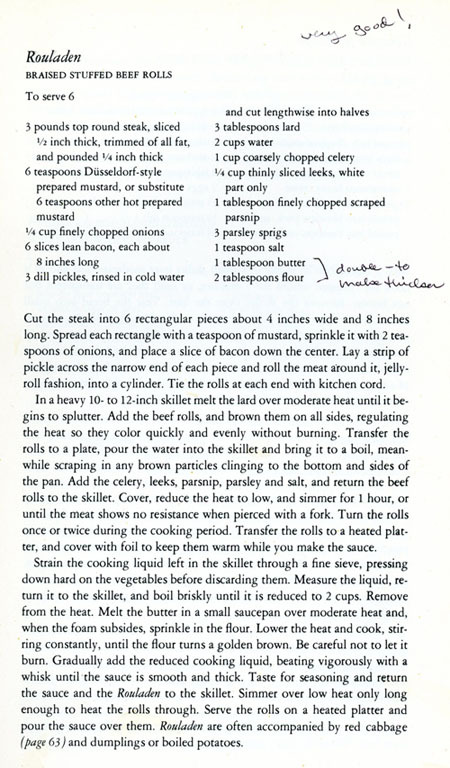 These are beef rolls, and the recipe suggests to serve them with spatzle (see scan below)). I’ve made Rouladen before but wow, how long ago was that! We both remember this dish but can’t remember the last time I made it and I can’t figure out why I haven’t made it since. 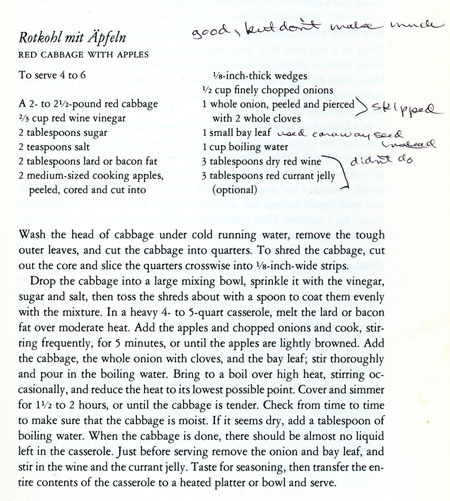 As suggested in the recipe, I’ll serve it with a little Red Cabbage with Apples. I modified the rouladen recipe a bit: I increased the onions, leeks, and parsnip in the cooking liquid, and I added some pepper. I made the sauce a bit differently, as described in my version of the recipe, below. Pound the steak until it is 1/4 inch thick. (I put it in a ziplock bag and pounded with a mallet.) If you are using a single piece of round steak or sirloin steak, cut it into two rectangular pieces about 4 inches wide and 8 inches long after pounding. I found that the petite sirloin steaks worked perfectly, as they were sold already the perfect size for this dish. Spread each rectangle with a teaspoon of mustard, then sprinkle with 2 teaspoons of onions (save the remaining onions for later). Place a piece of bacon lengthwise down the center. 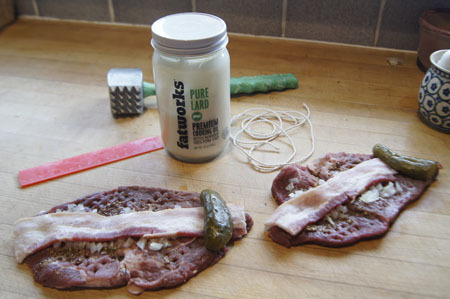 Lay a dill pickle half across the narrow end of each piece and beginning at the pickle end, roll the meat around it, jelly-roll fashion, into a cylinder. Tie the rolls at each end with kitchen cord. Choose a deep skillet with a heavy lid. I used my old cast-iron stewing pot; a LeCreuset or any heavy cooking pan or pot or skillet would work. Heat the skillet over moderate heat; add the lard (or butter) and heat until it begins to splutter. Add the beef rolls, and brown them on all sides, regulating the heat so they color quickly and evenly without burning. Transfer the rolls to a plate and set aside. Add the celery, leeks, parsnip, remaining onion, and salt and pepper to the skillet and cook and stir a minute or two to soften the vegetables. Add the water and bring it to a boil, stirring and scraping in any brown particles clinging to the bottom and sides of the pan. Add the parsley. Turn the heat to low and cover the pot. Monitor the pot for awhile: you want a gentle simmer. Let it simmer for an hour or so, turning the rolls once or twice. Remove the rolls from the pot and cover with foil to keep them from drying out while you make the sauce. Let the sauce cool awhile in the pot, then scoop the vegetables from the pot with a slotted spoon. Pour the liquid into a gravy separator. Alternatively, if your gravy separator has a strainer-type top, pour the entire contents of the pot through the strainer into the separator. You want these cooked vegetables! Save them! When the fat has separated from the water layer, pour the water layer into a blender or food processor, or better yet, into the cylindric container that comes with an immersion blender. Add the saved cooked veggies to the liquid, and blend or process or use an immersion blender to homogenize the mixture. Meanwhile, melt the tablespoon of butter in the skillet until it is foaming, then slowly add the 2 tablespoons of flour, stirring constantly. When all the flour is incorporated, stir a minute or two more, but do not let it burn. Then, slowly and with constant stirring, add the blended broth-vegetable mixture. When it is nicely thickened and bubbly, add the beef rolls, cover the pot, and heat 5-10 minutes to get the rolls to serving temperature. These were delicious! The gravy was amazing, thick and full of flavor. The pickle inside was fun. These remind us of one of our favorite meals, called “little piggies” by my husband’s family. It’s still about his favorite meal – strips of bacon on strips of round steak, rolled and secured with a toothpick, cooked in a skillet and served over mashed potatoes with gravy. I like the rouladen as made above with tender sirloin steak, because there is less fuss in preparation, and the de-fatted gravy isn’t greasy. 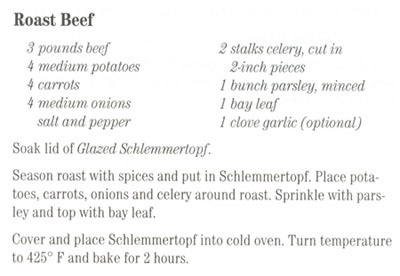 Cookbook #221: Original SchlemmerTopf® Recipes, Scheurich, circa 2009. 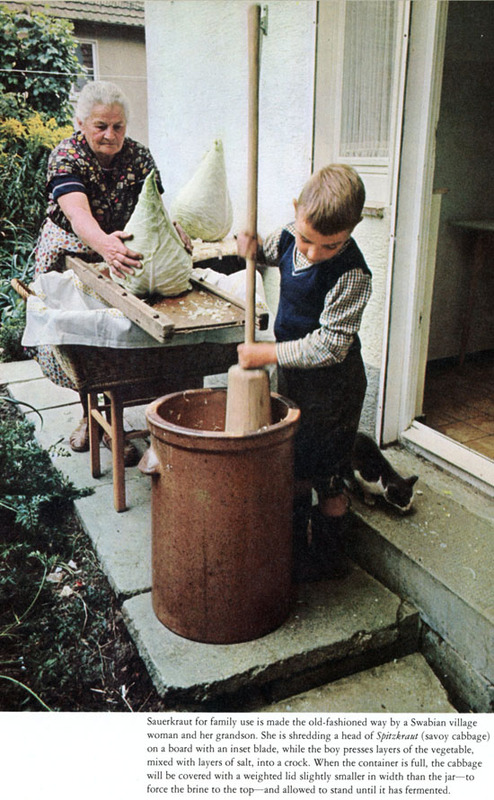 A “Schlemmertopf” is a covered clay baking pot. I wrote a lot of material on clay pots in Römertopf Cooking is Fun, and more in Original Schlemmertopf Recipes, so I won’t repeat that information here. Original SchlemmerTopf Recipes is the instruction and recipe booklet that came with my current SchlemmerTopf. I bought this clay pot in 2009 (plus or minus a year or two) to bake no-knead breads. 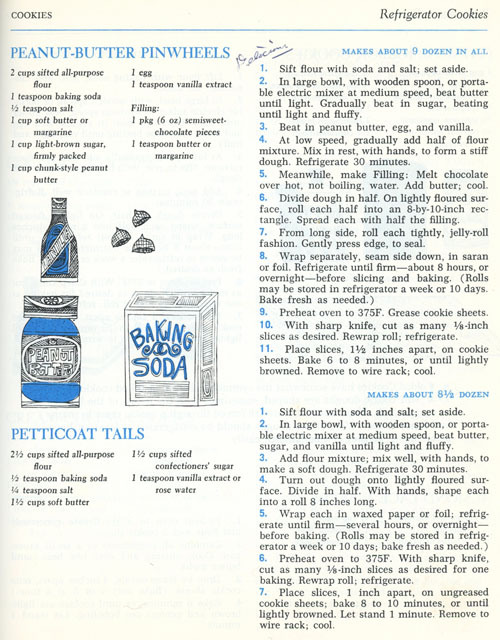 The back cover of Original SchlemmerTopf Recipes states that Reston Lloyd Ltd. is the exclusive US and Canada distributor for SchlemmerTopf. They suggest: “Visit our Web Site: www.restonlloyd.com” – so I did, and found that currently Reston Lloyd offers only the Romertopf® brand of covered clay baking pots. 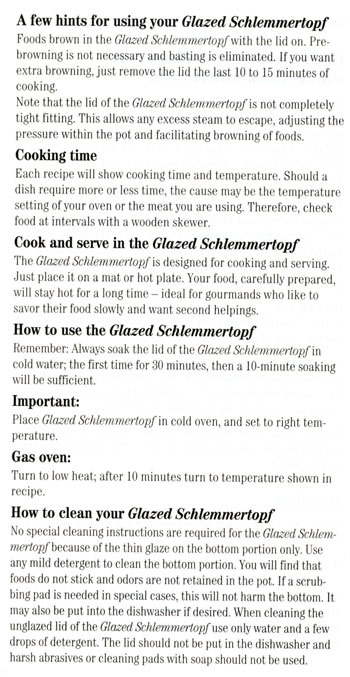 The bottom section of my SchlemmerTopf® is glazed; the top section is not. This makes it a lot easier to clean than the first clay pot I had. The unglazed top section needs to be soaked in water for about 10 minutes before use. After filling the bottom of the pot with recipe ingredients, the top is added, and the SchlemmerTopf® is put in a cold oven. Only then is the oven turned on, usually to a high temperature, like 425-475˚. And yes, my last two experiences with clay pot recipes for this blog were very successful! I need to remember to use this pot more often, and no only for baking bread! 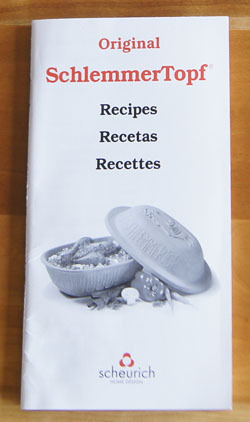 The first 23 pages of this booklet is written in English, then (as far as I can tell) the same instructions and recipes are written in Spanish and then in French. Example recipes are stuffed flank steak, beef stew, meat loaf, beef cabbage rolls, roast beef, chicken shanghai (I made this for another blog entry), chicken paprika, turkey curry, roast game hens, roast duck, and roast salmon. 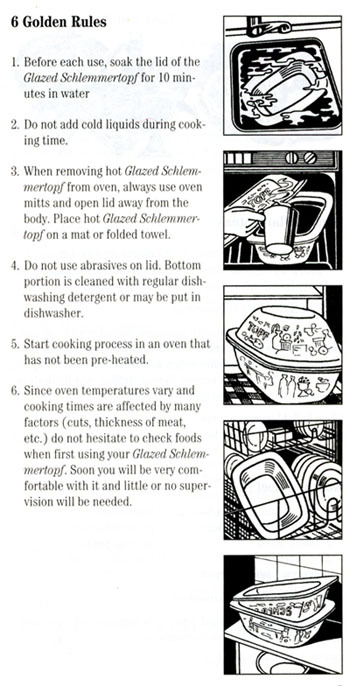 I find these recipes are helpful because they illustrate how to bake a variety of foods in the SchlemmerTopf. But, they are not very inspiring. Hmmm, shall I keep this small booklet? For a while. But I know I could live without it. For this blog I decide to make the Roast Beef. Largely because I have a small roast in the freezer! My roast is only about a pound and a half, so I will cut the recipe in half. Note how the recipe (above) does not state what cut of beef to use, nor does it tell me if the potatoes, carrots, and onions are to be peeled or chopped. It does direct the cook to cut the celery in “2-inch pieces”. I decided to peel and cut in half the potatoes, carrrots, and onions. Soak the lid of the SchlemmerTopf® in cold water for at least 10 minutes. Season the roast with salt and pepper and place in the base of the SchlemmerTopf®. Add the vegetables around the roast, then put the parsley and bay leaf on top. Place in a cold oven. Turn the oven to 425˚ and bake for 2 hours. Feel free to open the lid and check for doneness at any time, it won’t affect the baking. 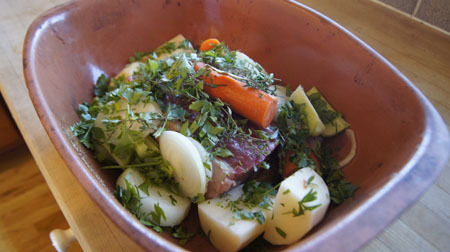 Here is the beef and vegetables, ready to go in the oven. And here is the finished roast. 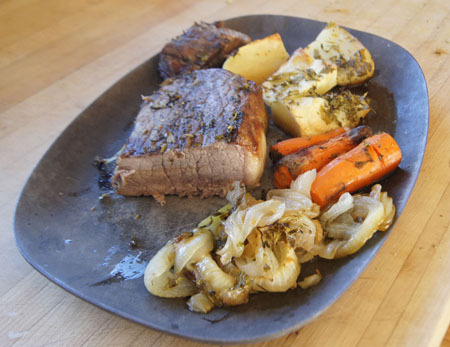 The leftover beef from this Beef Roast recipe was great the next day, sliced thin in sandwiches. So I’d say the recipe was a success!